Over the weekend, I had probably the most social two days that I have had in months. I don’t mean to turn into a little hobbit in my little hobbit hole every winter but I always do. Once spring returns, I dig out of my pile of knit blankets, flannel, and take out containers and make up for all the social events I avoided over the winter. However, Marc’s friend was in town so we went out in public for more than a couple of hours, and it was so fun!! On the other hand, nobody tells you that 23 is the year when it starts to take two days to recover from a night of drinking (even if you didn’t wake up with a hangover! ), and I think that’s rude. I thought that our elders were meant to pass on their wisdom? We started the weekend off by eating lots of homemade pretzels with mustard and beer. AKA a great start to any weekend. There was also Chinese food, gin + tonics, late-night pizza, and board games. The tequila shots came out right before our Lyft showed up. But, I poured mine into a blood orange margarita because I have already been down that road and learned from my mistakes. 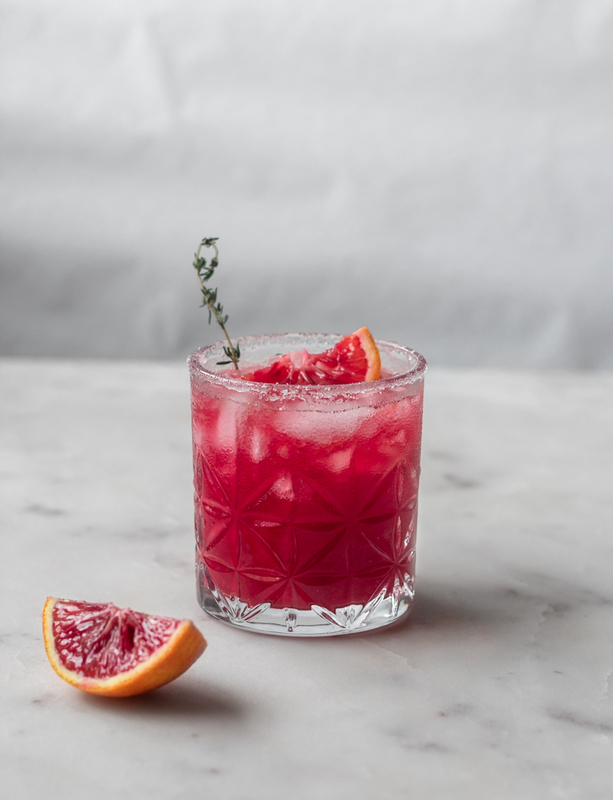 Speaking of blood orange margaritas, I have officially decided that margaritas are the best use for blood oranges. Around this time last year, I shared a recipe that was good, and I tried my hand at moody photography. (Note: it was no bueno). I realized over the weekend that the blood orange margaritas, while delicious, needed a bit of an upgrade. Plus, last year, I used this recipe as a “Valentine’s Day” post. 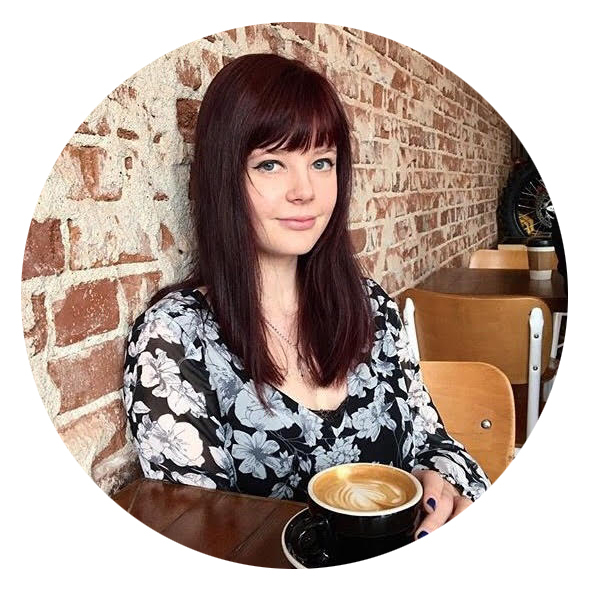 While I appreciate that 2018 Sara was single and celebrated V-Day with a pitcher of margaritas for herself, time’s have a-changed. This year, I tested the recipe on Marc, and he noted that there was not quite enough tequila in my recipe. And he was right, the ratios were totally off! 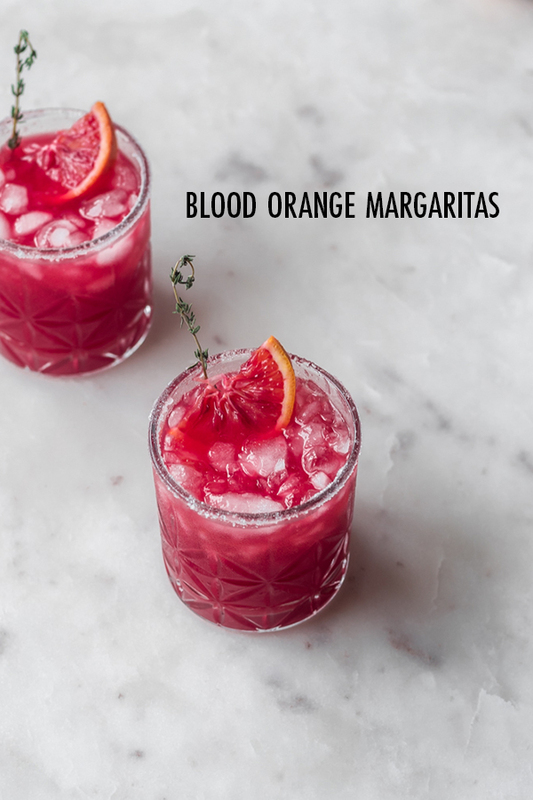 However, I am now older and wiser, so let’s revisit the blood orange margarita, shall we? 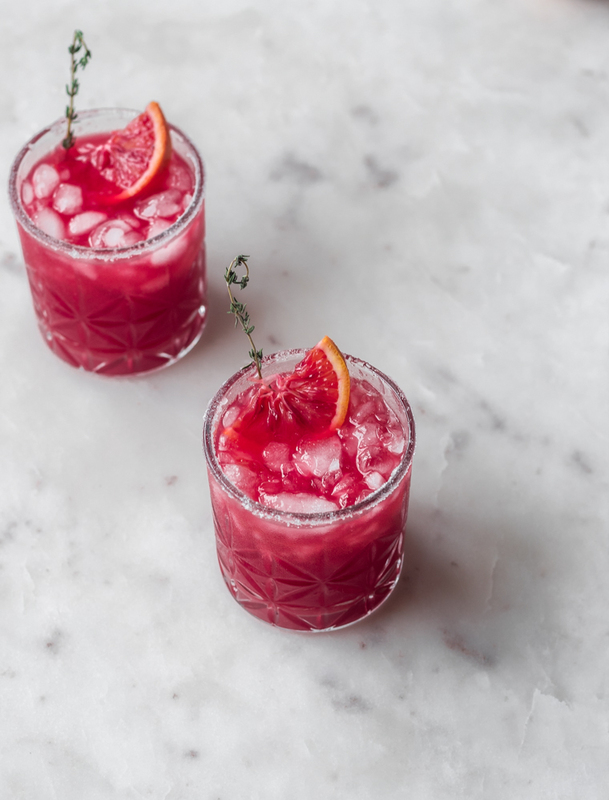 To start, I don’t even know if it’s appropriate to share a blood orange margarita recipe during Dry January. I am just going to assume most of you have succumbed to the mess that is January and started drinking a few days early. Or maybe you’re looking for a “celebration” drink come this weekend. Either way, I am *proud* of you. I chose not to participate because honestly, I only have a couple of drinks over the weekends. So for me, it seemed like too easy of a goal. Instead, I vowed to add an extra day at the gym and eat more veg meals. And it’s been successful, soooo yay?! Next, it’s totally fine if you don’t use blood oranges for this recipe. While I like the sweetness from blood oranges, they can be hard to find. Use regular oranges or whatever is in season at your grocery! You will also need some limes. I recommend a citrus press if you don’t already have one. To complement the orange, I made this a typical “Cadillac-style” margarita with tequila + orange liqueur. 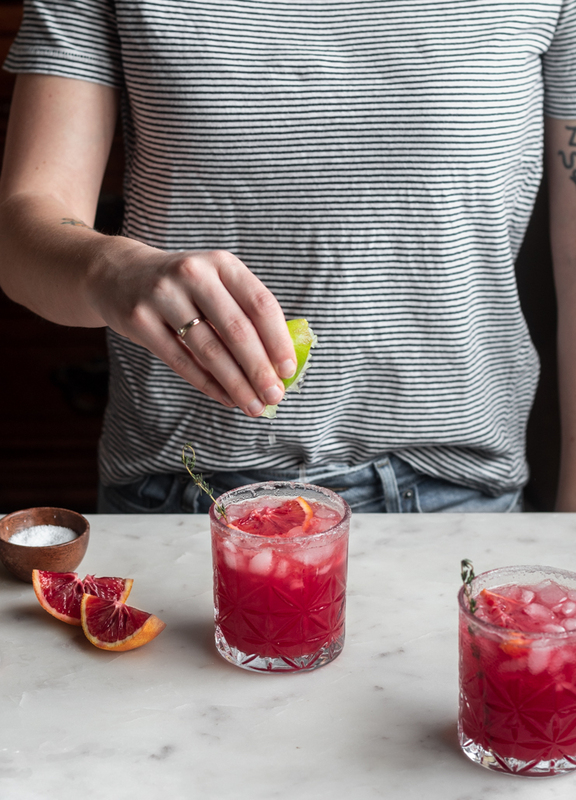 For a less boozy drink, skip the orange liqueur or cut down on the tequila by 1/2 – 1 oz. Lastly, and this is important, I am a die-hard “salt, on the rocks” girl. However, the citrus is rather zesty, so you can always use a sugar rim. 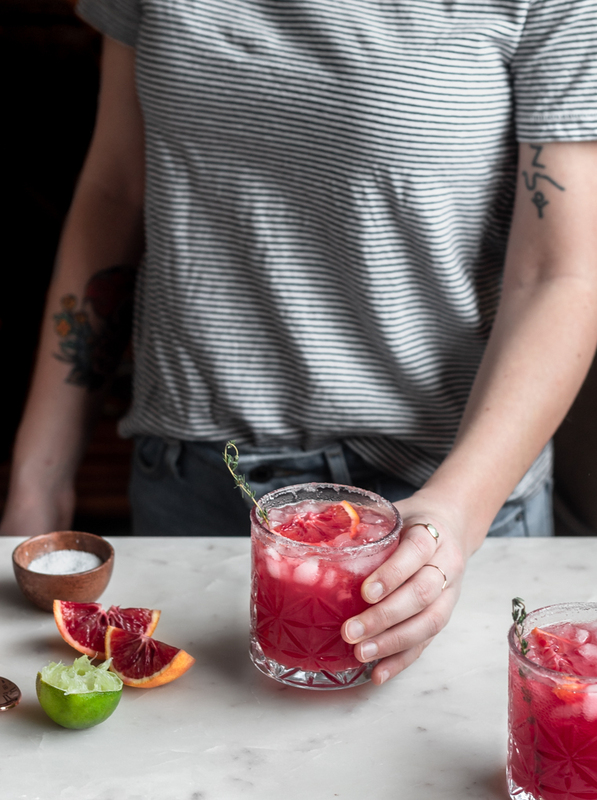 Also, I have never made a blended blood orange margarita before, but if you do, please share! 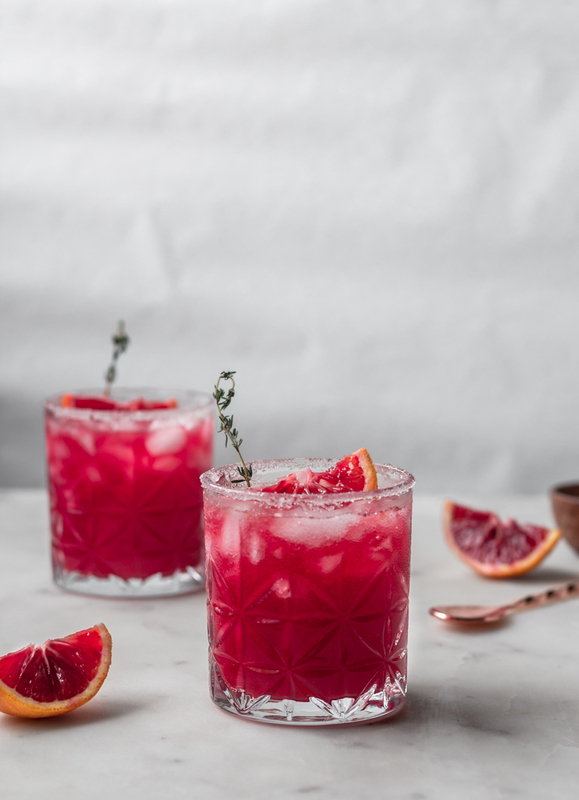 I am a very traditional "salt, on-the-rocks" girl, but these blood orange margaritas are also great with a sugar rim! 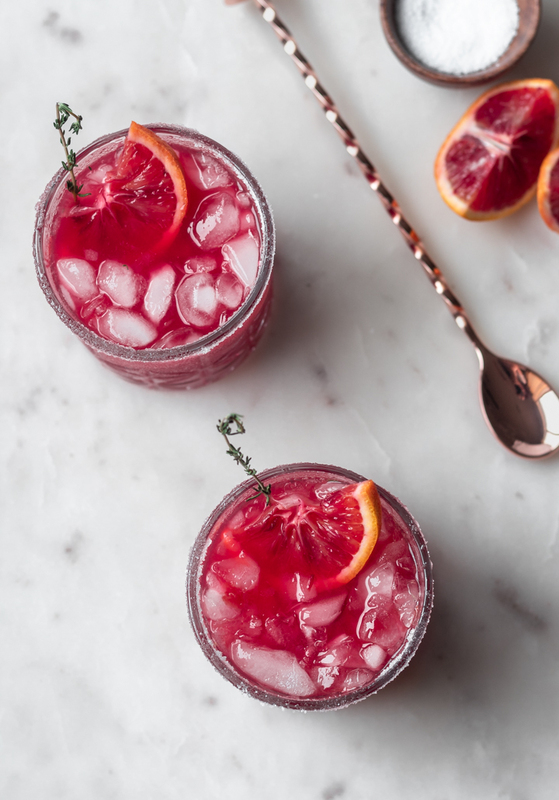 Feel free to use regular oranges, or another type of citrus, if blood oranges are out of season. Begin by juicing your blood oranges and limes. 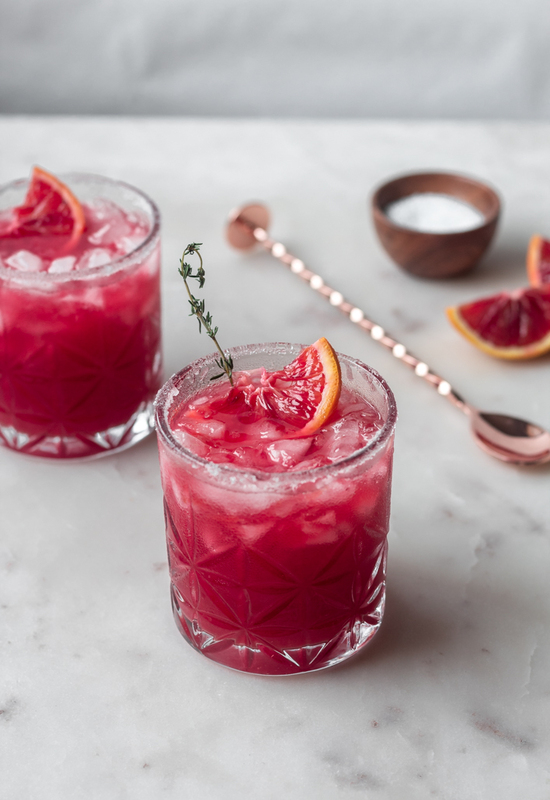 To make the margarita mix, combine the blood orange juice, lime juice, tequila, orange liqueur, and simple syrup in a small pitcher. Taste, and add more simple syrup, alcohol, or juice as necessary. Refrigerate until you're ready to serve. To assemble the margaritas, place about 2 Tablespoons of margarita salt or sugar on a plate, and gently tap the plate to spread it out. Rub the rim of four margarita glasses with a wedge of lime. Press the rim of the glasses into the salt or sugar to ensure an even coat. Fill each glass with ice, and add 5.25 ounces of the margarita mix. 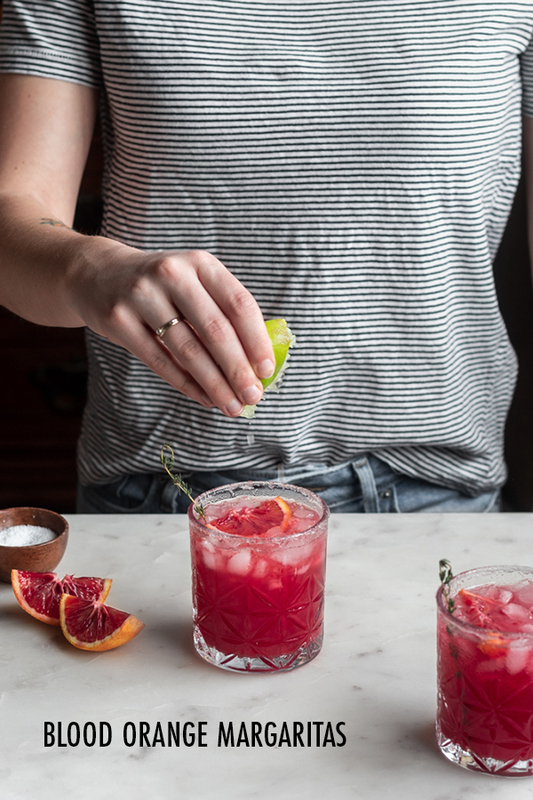 Garnish with a blood orange wedge or lime wedge if desired. Serve immediately.